It’s been thirty years since Apollo Creed was killed in the boxing ring by Ivan Drago (Dolph Lundgren). And now, with the ascent of Adonis Creed (Michael B. Jordan) to the position of the light heavyweight champion of the world Ivan is back on the boxing scene as well, this time as the coach of his own son, Viktor (Florian Munteanu). It’ll take the words and wisdom of Rocky Balboa (Sylvester Stallone) to condition young Adonis into the fighter he’ll need to be to maintain his title. But to achieve great success will also take great risk, in this case the possibility of death. Will Adonis find his mojo before he finds his fate, and what about the love of his fiance, Bianca (Tessa Thompson), and mother (Phylicia Rashad)? 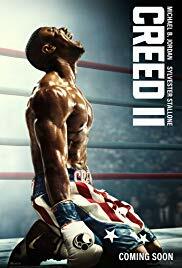 Directed by Steven Caple Jr. and Written by Cheo Hodari Coker this repeating of fictional boxing history makes for a poetic concept but ultimately fails to land all of its punches in comparison to its predecessor Creed (2015). Specifically lacking this round, intimacy within the ring, the absence of Cinematographer Maryse Alberti is felt in each action sequence with a lack of finesse to the overall choreography and scope, sigh. But, let’s be quick to point out, the punches that do land are massive body blows, and, even if the entire script is telegraphed from frame one, there’s still something inherently inspiring about the re-telling of an old legend in new form handing off the baton one more time. Ensemble wise, all players are on key and on point, success continues. Perhaps a matinee for your Thanksgiving weekend? Creed II is rated PG-13.